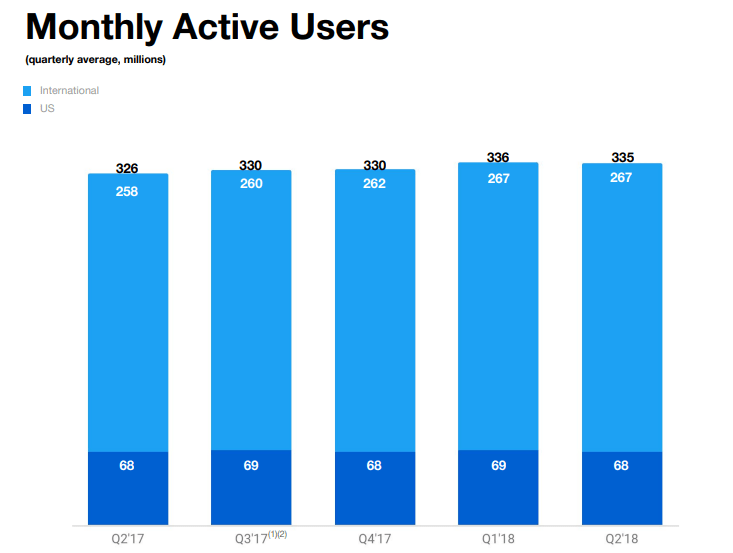 Twitter has reported stunted growth in user numbers in Q2 2018, one day after Facebook reported its own growth slump. While Facebook dropped its growth rate, it still managed to add 38 million new users to the platform for the period. Twitter went the other way around. Twitter quickly pointed to its efforts to curb spam, bots and misuse, as it recently dropped inactive accounts from Followers. While not a part of its monthly active users count, these inactive accounts are part of the company’s broader plans. It still took a hit on its performance stats. Twitter also decided not to renew or switch to paid SMS carrier partnerships in some markets. It cited allocating resources to GDPR and health. Thus, MAUs may continue to decline in the next quarter. “Based on our current level of visibility, we expect the decline to be mid-single-digit millions of MAU,” Twitter added. The market frowned. The expectation of further decline had Twitter shares drop their biggest since October 2016 at 19 percent. While overall growth rate dropped, the company reported an 11 percent increase of daily users. It marked the seventh consecutive quarter that Twitter grew 11 percent on this metric. The market only sees overall user growth, as more users mean more ad opportunities. But Twitter is showing that an increase in daily active users and retention time may just be as effective. Marketers do have long-term fears for Twitter, as most traffic spikes rely on tweets from POTUS Trump. If Twitter can increase time spent on its app, it may overshadow concerns over its future. And its removal of spam and bots can increase its ad value, although this is hypothetical at this stage. 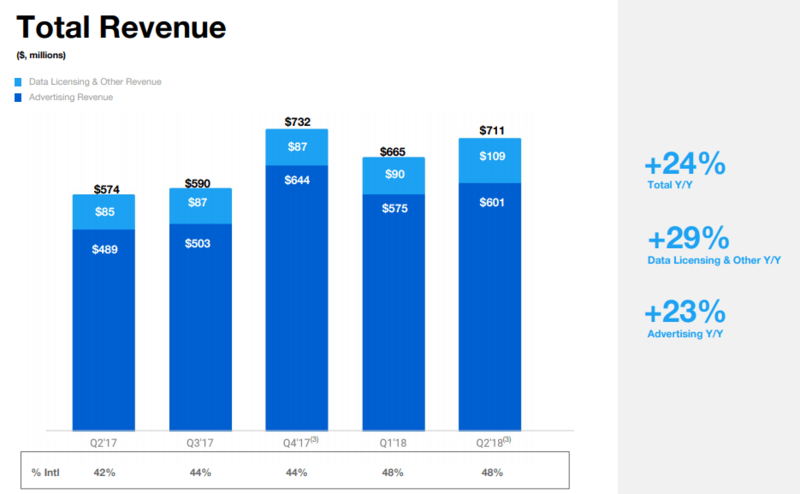 Twitter earned $711 million for the second quarter, with a year-on-year growth rate of 24 percent. While that’s a good number to ride on, the company warned that the number would likely fall under market estimates over the next quarter. As results from international markets increased, Twitter was struggling to earn more on its own turf—North America. And marketers want to see positive results in Q3. Still, the global expansion continues. Twitter has been working on its offerings in Japan, its second largest market after the US. Market watchers expected the decline, as they saw Twitter exert more effort in its drive to thwart the rise in spams and bots. Even with the market highlighting the overall user decline, the company had good results in other aspects. And the wipeout of bad elements is always a positive move, even if results take long to catch up. 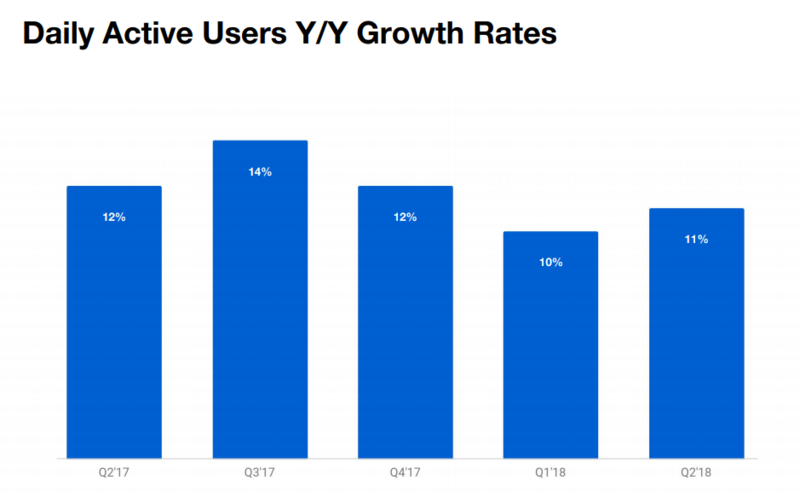 Rather than rely on higher overall user count, investors better put their faith in Twitter’s vision to refine its platform. Will Twitter attract more investors to its ad offerings after the stricter rules on spams and bots? Will the user count continue to drop, with Twitter losing traction against rivals on ad spend? While Twitter had mostly positive results for users and advertisers, it still has some risks for investors. If you are an investor, you must gauge your trust in Twitter’s leadership and management. Read the full Q2 financial report here.